Sometimes it is the littlest things that make an impression. Recently we added a tiny atomizer kit for under $4. 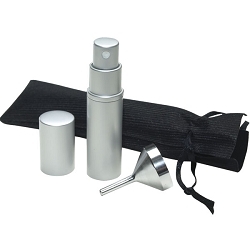 It can be filled with any fragrance or liquid and voila -- a pocket sized spray. I took mine and added a few drops of ESS Lemongrass Water-Soluble Essential Oil and then added water. A few times during the day, I spray a few pumps in my workspace and... ahhhhhhh, instant calm. The Lemongrass is calming, reduces stress, helps fight jet lag, and it is also great as a toner for oily skin. The Atomizer Kit facilitates the dispersion. The Atomizer is just too cool! ALSO Great for quickly scenting your spa room, a quick refreshing water mist on a hot day, or even odor control in the bathroom... all from a discreet bottle that easily slips into your purse, pocket, or the palm of your hand!